He knows all too well how dangerous love can be.. .
Charles Morwellan, eighth Earl of Meredith, has seen many happy Cynster unions, but he also watched his father's obsessive love nearly destroy their family. Yet he knows his duty, and so has chosen a bride. Sarah Conningham is beautiful, intelligent, and knows the value of his offer. Imagine his shock when she refuses to wed for anything less than intense, unbridled, unbounded love. Now he's determined to win her! In a tantalizing game of pleasure and persuasion, Charles courts Sarah with excruciating propriety during the day, but each night spirits her away into the moonlit gardens, where he tutors her in the art of passion. 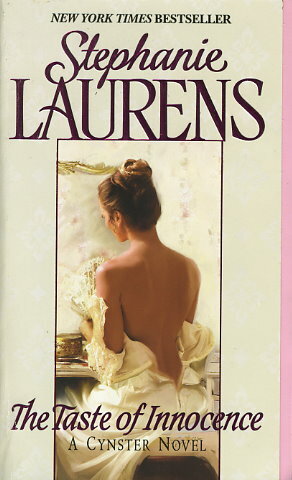 Yet, after their wedding, his polite mask returns, leaving Sarah wondering which man she actually married: the controlled aristocrat, or the lover whose touch leaves her gasping. But then Sarah's life is threatened and Charles must discover just how much he is willing to surrender to protect... the taste of innocence.